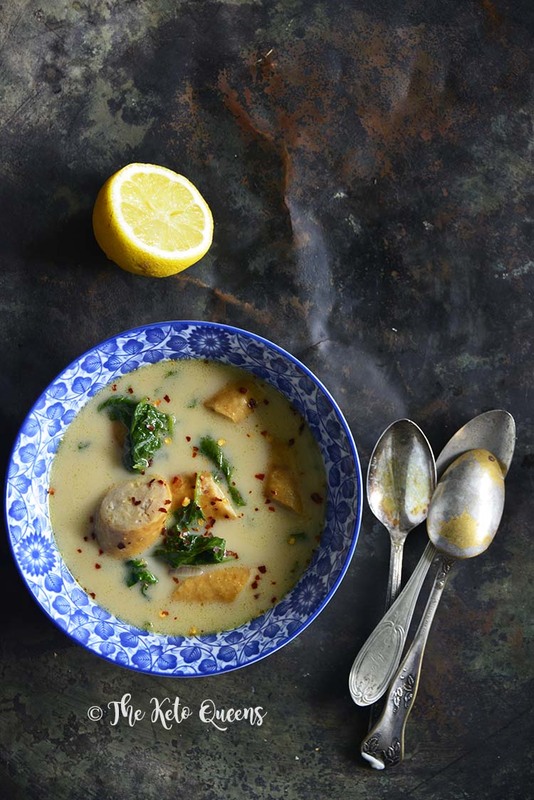 If you’re looking for a sausage and spinach soup recipe, you are going to LOVE this one! It’s so flavorful, creamy, and a real crowd-pleasing recipe! I can’t tell you how many times this spinach soup has saved the day since it’s not only a quick recipe but so nourishing too! It’s our spin on a creamy sausage soup with greens and potatoes from a popular Italian restaurant and while it’s a keto diet soup, it only sacrifices the carbs and not the flavor – AT ALL!! Now – scroll down below to make your own creamy keto soup! Which soups are low carb? Typically, you can make your own homemade soup low carb in anyway that you want. But if you’re looking for canned keto soup, it can vary significantly. A few of our favorites to make homemade are things like roasted broccoli and cheddar, roasted cauliflower, or even creamy cauliflower and cam… or this creamy sausage and spinach soup. Generally speaking, you can make almost any soup low carb and safe to eat! What is the lowest carb canned soup? When it comes to keto soup recipes, homemade is always the way to go since you can make them keto yourself. But if you’re going for canned… we have found the best soups to be broth and stock soups since they have nearly no carbs at all. How many calories in low carb soup? The amount of calories in a low carb soup really varies just as the carbs do. Generally though… low carb soups will have around 100 calories per serving. Keto soup recipes are a great keto-friendly meal for this reason! Is homemade soup low carb? Homemade keto soup recipes are actually the best choices of all – you can make anything low carb almost! Just adjust the recipe to keto-friendly ingredients and you are good to go! It really depends on the soup you are making… but in general – making keto soup is quite simple. You can either use some canned soup which usually only requires heating and sometimes adding water. But if you want to make homemade soups from scratch… those require a few more steps. When it comes to making homemade soups thicker… it can be tricky. Generally, you’ll add thickeners such as cornstarch or flour. But since we want to keep it keto-friendly – you will want to be very careful. Unfortunately, it’s hard to thicken keto-soups while being strict. Things like flax-seed and almond flour make TERRIBLE roux. A tablespoon of traditional flour is 6 carbs and is usually spread out among 4-6 servings. I would say to add some flour… just be mindful about how much you are using. How do I make homemade soup? We are a family that LOVES to make homemade soups from scratch. They are so delicious, thick, hearty and very nutritious. If you’ve never made it before, however… you might be a little lost. Generally speaking, you heat up your ingredients with some broth and cook it until it’s done. Now that’s a VERY general statement since recipes very heavily depending on the type of ingredients and if it’s a stovetop or one of the slow cooker creamy soup recipes. Now if you want more specific directions on how to make keto soup and make it from scratch… there is a general framework that you can follow to come out with delicious hearty soup! To start making your low carb soup, choose your favorite fat source to go with the initial flavors of your recipe. Then pick your base broth or puree… for this spinach soup recipe, you’ll use chicken bone broth. After that you just choose your veggies, spices, and meat to use. Once you’ve picked everything to use, you’ll sauté veggies, cook meat, add the base, and throw in any additional spices or ingredients. From there, you simmer for a few hours (or you can use a slow cooker). It can be a lot of fun coming up with different flavor combinations. For a full recipe, just scroll down below to make your very own cream keto soup. Keto Weeknight Creamy Sausage and Spinach Soup is a crowd-pleasing recipe that’ll become your go-to meal on those busy nights when you have less than 30 minutes to get dinner on the table and still want to eat healthy! Heat the ghee in a 3-quart saucepan over medium to medium-high heat. Add the sausage and onion and cook until the sausage is starting to brown and the onion is softened, about 6 to 8 minutes, stirring occasionally. Add the garlic and cook 1 minute more, stirring constantly. Add the bone broth and crushed red pepper flakes and bring up to a boil; cover the saucepan, turn the heat down to simmer, and cook 5 minutes. Stir in the spinach and cook until wilted, stirring constantly, about 1 to 2 minutes. Turn off the heat and stir in the cream. Taste and season with sea salt and black pepper as desired. Serve with fresh lemon wedges to squeeze into the soup if desired.